There are a host of excellent value hotels in Jerusalem with a lot to offer at affordable prices. Jerusalem hotels offer great accomadation & vacation deals in the city all year long, including holidays and hot seasons. If you’re looking to get the most bang out of your buck, look no further than our list of top value hotels around the city. Jonathan Hotel is located at the very heart of Jerusalem. The guestrooms are spacious and intimate and fully equipped to help you relax after a fun hangout in the capital. Nearby the hotel, you’ll find the small and unique stores of Jaffa Street and of Ben Yehuda Pedestrian Street. You will also find romantic, as well as, family-friendly restaurants, Machane Yehuda Market and more. The hotel’s apartments are perfect for couples and the spacious suites are ideal for families. Overlooking the magical view of the Old City is Bell Hotel (Paamonim Hotel) in the City Center of Jerusalem. The hotel is designed as an apartments hotel and grants a full and unique Jerusalem experience. The staff is attentive and professional and excels at creating an extra-ordinary hospitality atmosphere. Guests can enjoy free Wi-Fi in all of the hotel’s rooms and spaces. In addition, the hotel’s proximity to all of the city’s sites, attractions and entertainment districts makes it one of the most preferable accommodation options out there. Little Houses Hotels is an Israeli hotel chain known for its European style and design. The chain offers three boutique hotels in Jerusalem’s most picturesque neighborhoods: German Colony, Bakaha and Rechavia. Besides their beautiful landscapes, these neighborhoods are filled with rich history and must-see buildings and attractions. Little House in The Colony is situated on an enchanting street at the heart of the German Colony. In a walking distance from the hotel, you’ll find Emek Refaim Street with the city’s most unique boutiques and fine-dining restaurants. You will also find Jerusalem Theatre, Liberty Bell Park and The First Station Complex. Guestrooms are designed in a rural style, creating a cozy and intimate atmosphere. The hotel’s guests can enjoy a rich Israeli breakfast at the hotel’s roofed patio. Housed in a proper Arabian building, Little House in Bakah is a boutique hotel that is built in the shape of an ancient castle with a welcoming, Mediterranean atmosphere. 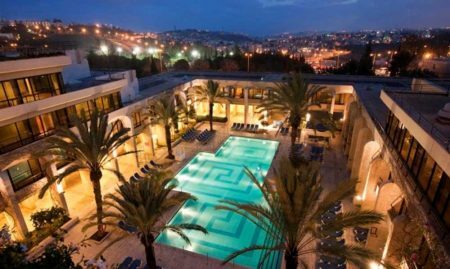 The hotel is located just next to Beit Lechem Rd, where you can find a variety of local restaurants and cafes, and most importantly, one of Jerusalem’s most beautiful promenades with a stunning panoramic view of East and West Jerusalem. The recently renovated hotel offers beautifully designed furnished guestrooms and suites. In addition, guests will find a 24 hours coffee& tea stand and an Italian restaurant inside the hotel’s beautiful garden. Little House in Rehavia is an ancient beautiful stone house located in a quiet street in the luxurious Rechavia neighborhood, close to the Prime Minister’s Residence. Functioning both as a hotel and a gallery, the hotel’s walls display 30 works that depict Jerusalem’s most unique architecture by artist Amnon Gadol. In a walking distance, you will find the Great Synagogue, which is absolutely worth a visit. The City Center, The Old City and Mamilla Mall are all very easy to get to as well. On the other side of the hotel, you’ll find the The Israel Museum and The Knesset (Israeli Parliament). Sandwiched between the luxurious King David Hotel and David Citadel Hotel on prestigious King David Street is the more modest Eldan Hotel. While the hotel does not compromise on comfort or the necessities demanded by the discerning traveler, the hotel offers the best location and rates (about half the price of its illustrious neighboring hotels). The Eldan’s 76 rooms are clean and quiet with full bathrooms. A room should set you back around $220 (including a plentiful breakfast) making it an affordable value hotel. Situated in the upscale quiet residential neighborhood of Talbiyeh, the Prima Royale offers comfort, culture and elegant decor. The hotel offers 133 rooms, which are small but clean, including seven suites. Hotel facilities include a cafe, synagogue, gym, spa, business center, seminar and conference halls as well as a renowned “Champagne and Chopin” breakfast and an evening complete with a live pianist in the hotel lobby. A room should cost you around $195. Jaffa 35 Apartments is another great accommodation option located at the very heart of the City Center in Jerusalem. The apartments in this modernly designed aparthotel are ideal for families and include spacious one-bed room apartments with a living area, sofa-beds, and a fully equipped kitchenette where you can prepare your own meals. This is perfect for those who are looking for the winning combination of independent travel, homely atmosphere, and proximity to the city’s major attractions: the Old City, Machane Yehuda, Mamilla Avenue, and more. Mount Zion Hotel is best known for its great location and spectacular views of the Old City walls. Located in a 19th-century building, the hotel décor is charming with Middle Eastern touches. Hotel facilities include lush gardens, a large swimming pool, indoor and outdoor Jacuzzis, a spa and a health club including a traditional hamam (Turkish bath). Mount Zion Hotel offers more than 140 guest rooms that start from $224, with a delicious buffet breakfast included in the price. One of the most celebrated boutique hotels in the city, Mount Zion offers good value for money, and is an attractive choice for all types of travellers. Located in the City Center, Koresh Hotel is a fun, young and dynamic hotel that offers fully equipped Deluxe rooms and family suites for affordable prices. The hotel is perfect for couples who are looking to enjoy the city’s attractions, dine in restaurants and hit the stores. Families will also find this hotel very attractive due its spacious suites designed especially to accommodate family vacations. On Wednesday night, the hotel’s bar hosts live show performances by the best local artists. House 57 Bed & Breakfast is one of Jerusalem’s first home style accommodations providing warm and personal hospitality at a reasonable price. The seven private rooms are great for large families. Breakfast is served in the beautiful backyard allowing the opportunity for guests to meet each other and discuss touring tips. House 57 is located in a convenient, quiet and safe residential neighborhood with free parking and in walking proximity to Jerusalem’s light rail. The rooms’ prices are based on the number of guests per room. A room for two guest is $99 per night including breakfast. Special discount are available for groups or long term stays. Eden Jerusalem Hotel is a peaceful family hotel in the quiet Talpiot – Arnona neighborhood in Jerusalem, close to Baka and the German Colony and accessible to the city center by public transport. The hotel’s 24 comfortable suites and rooms are suitable for solo or group travellers, business or leisure. All rooms have cable TV, coffee facilities, a small refrigerator, private bathrooms, and air conditioning. Free WiFi is available in the lobby. A double room will cost between $130 and $149 depending on the time of the week and season (holidays cost extra) and for those on a tight budget there are small double rooms available from just $95. One of the best things about the Jerusalem Inn is its central yet quiet location, just steps away from the Jerusalem light rail, Zion Square and Ben Yehuda pedestrian mall and not a far walk from the Old City. Those looking for the ultimate in entertainment in Jerusalem will enjoy the wide choice of restaurants, bars and nightclubs in the area. Rooms (26) are considered on the small side but are known to be simple, clean and elegant. The staff has a reputation for being helpful and friendly. The rate for a double room ranges from $129 – $164 and includes an Israeli buffet breakfast.